■ BEIJING — One Chinese activist died after the authorities ignored pleas to treat her liver disease while she was in detention. Another was left with years of chronic pain after prison doctors misdiagnosed a problem with his pancreas. 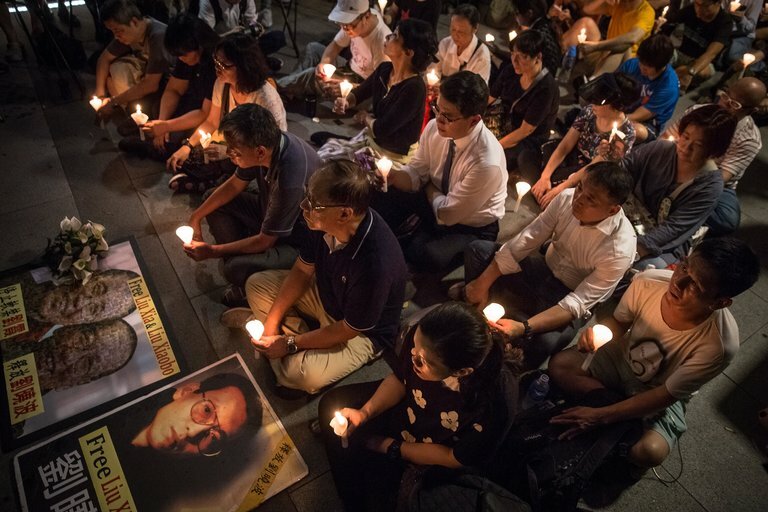 Accusations that Liu Xiaobo, the imprisoned Nobel Peace laureate who has late-stage liver cancer, has not received proper treatment have brought new scrutiny to what human rights advocates say is a pattern in Chinese prisons: the denial of health care to dissidents to intimidate and punish them. At some prisons, requests for health checkups and medicine are refused, human rights experts and former prisoners say. At others, ill prisoners suffer physical abuse and malnutrition. In some cases, chronic ailments and serious diseases are left untreated, or medical care is repeatedly delayed. seen during a candlelight vigil in Hong Kong last month. 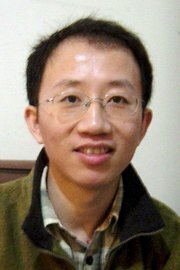 Critics have faulted prison officials for failing to tend to Mr.
“There is a real fear amongst prisoners of conscience and their families that authorities aren’t afraid to let them die from lack of adequate medical care,” said Frances Eve, a researcher at Chinese Human Rights Defenders, a coalition of advocates. Mr. Liu, 61, who is serving an 11-year sentence for “inciting subversion of state power,” is being treated for advanced liver cancer at a hospital in the northeastern city of Shenyang, the authorities announced last month. Critics have faulted prison officials for failing to tend to Mr. Liu’s cancer earlier, which they say might have afforded him a better chance at a recovery. And on Monday, the Chinese authorities rebuffed calls that he be transferred abroad for treatment. Activists say the decisions reflect a pattern of neglecting the health of incarcerated activists. Since President Xi Jinping became the national leader in 2012, the ruling Communist Party has taken a hard line against critics, imprisoning scores of activists, lawyers and journalists. Dissidents who have spent time in prison say the harassment continues there. need to treat people as human beings." Mr. Hu said doctors repeatedly misdiagnosed pains that he felt in his abdomen as a side stitch. When he was released from prison, doctors found that he actually had acute pancreatitis, a potentially life-threatening illness. In at least two recent cases, imprisoned critics who had requested medical parole for treatment of life-threatening conditions died after their pleas for medical care were rejected. In 2014, Cao Shunli, an activist who was detained in Beijing after leading a human rights campaign, died after the authorities denied her requests for medical parole to treat tuberculosis, liver disease and other ailments. In 2015, a prominent Tibetan religious leader, Tenzin Delek Rinpoche, 65, died while serving a prison sentence on charges of “terrorism and inciting separatism” after his request for medical parole to treat a heart ailment went unanswered. The government has denied depriving political prisoners access to health care as a means of retaliation. “China has repeatedly said that Chinese judicial departments protect every right of prisoners according to law,” the Ministry of Foreign Affairs said in a statement on Monday. Chinese prisons, which house more than 1.6 million inmates, are notoriously grueling institutions, plagued by torture, forced labor and malnutrition. Political dissidents battling illnesses while in detention face additional threats to their well-being, activists say. At some prisons, medical workers are ambivalent about treating inmates; others are poorly trained and ill equipped to handle serious diseases, experts say. A 2011 survey of a prison hospital in Shanghai found that 28 percent of doctors said the nature of the crimes committed by patients had affected their diagnosis and treatment. Tang Jingling, a human rights lawyer in southern China who was sentenced last year to five years in prison for subversion of state power, fell ill last month with stabbing pains in his heart, according to his relatives. But the prison where he is being held in the southern province of Guangdong would not treat him, they said. In China, law enforcement officers, not doctors, usually make decisions about medical parole; as a result, many requests for parole are denied, advocates say. Occasionally, the government has shown signs of compromise, such as in 2015, when it granted medical parole to Gao Yu, a journalist who was serving a prison sentence on charges of leaking a Communist Party document. Ms. Gao has high blood pressure and cardiovascular ailments. Still, those who receive parole are often strictly monitored and rarely have the freedom to see doctors of their choosing. Torture and other abusive practices in prisons have exacerbated the health problems of many inmates. Malnutrition is common in some jails because of the poor quality of meals. Sleep deprivation has also been used as a tactic against dissidents, rights activists say. Yang Maodong, a democracy activist from southern China now serving a six-year sentence, was subjected to sleep deprivation and harassment by guards last year at a prison in Guangdong, according to relatives. Mr. Yang, 51, who is also known by his pen name, Guo Feixiong, lost a third of his weight and had difficulty walking. Mr. Yang was sent to a prison hospital but continued to suffer abuse, he told relatives. He was held in a small, windowless room with four other patients, and prison doctors refused to conduct a physical examination. where Mr. Liu is being treated for advanced liver cancer. Zhang Qing, Mr. Yang’s wife, said he was still very weak and pale. “He says he is now taking care of his own health and will live for his family and his unfinished cause,” she said. While medical care in jails can be poor, treatment at pretrial detention centers, which typically lack dedicated medical facilities, is often worse. 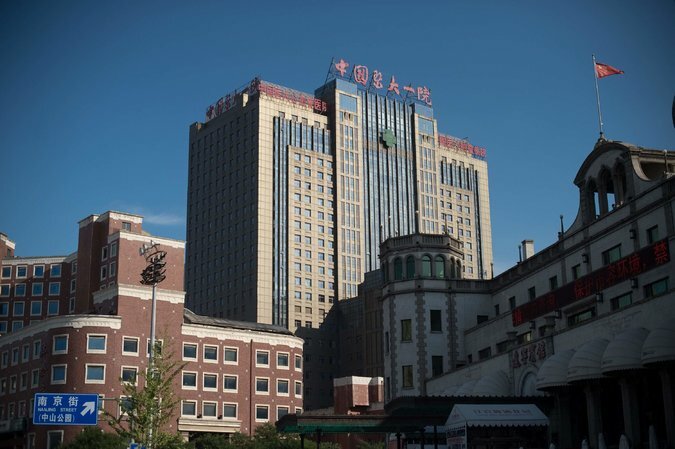 The Chinese government was widely criticized in 2014 after the death of Ms. Cao, who died at a detention center about five months after her arrest. A 2015 report by Human Rights Watch, citing interviews with former detainees, found that medical care provided by detention centers was “rudimentary at best.” The report said that officials barred seriously ill inmates from seeking care outside detention centers, contrary to international standards. The case of Mr. Liu, who was awarded the Nobel Peace Prize in 2010, has brought fresh worries to relatives of many imprisoned activists. The Chinese government has made a point of showcasing the high quality of the treatment Mr. Liu is receiving, even inviting doctors from Germany and the United States to visit him. But relatives of activists are concerned that the government is sending another message: that officials are content to allow dissidents to wither in prison until it may be too late. 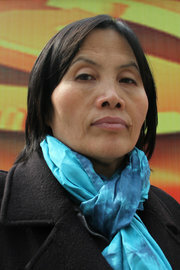 Ms. Zhang, who now lives in the United States, said she worried other prisoners might endure Mr. Liu’s fate. Iris Zhao and Adam Wu contributed research.